Well got a little more done this weekend. Rear suspension is in, just finishing up the axle housing mods for the elocker. Then I'll be back and focusing on the front some more. Need to check the flex and see what rubs and hits. I think I may be okay with my pitman arm as the suspension flexes the axles moves and may clear. Need to get this back together to really know. They are the 5125 Series Bilstein shocks. They are 13.5" collapsed. I still need to add my bump stops anyhow. Imagine a suspension setup that had zero up-travel and 36 inches of potential down travel. If you were to drive that vehicle up a ramp the tire on the ramp would immediately start lifting the body and causing the entire vehicle to lean to the side. It might even be possible to drive far enough up the ramp for the vehicle body/frame to be at 30 degrees, or more, while still having the rear tires hanging down and still making contact. The front tire on the ramp will be support a lot of weight while the rear tires won't have much at all because it's just about ready to lift. The end result is the front tire will struggle to pull the vehicle up the ramp/obstacle and the rear tire won't have enough contact pressure to push. As with all things there's certainly a balance, but having as much up-travel as is possible given the suspension limitation, clearance, and resulting CG of the vehicle is a good thing. I wouldn't choose to let a shock be my limiting factor for up-travel if at all possible. I'd much rather maximize my suspensions compression even if it means limiting the extension simply because of what it does to weight distribution. Once the suspension hits the bump stops it forces that tire to start carrying more of the weight of the truck and if there's no weight on a tire that's hanging down out of the wheel well it won't really provide much traction for forward progress anyways. Just my two cents. It's entirely possible that your shocks are a good match for the rest of the vehicle, it's impossible to tell for sure in the pictures. That's a very good explanation. The more I stare at it the more I think I need to go shorter. I don't like the idea of limiting my down travel but at the same time it makes sense to keep it so I don't limit up travel. It's 3 1/2" to the bottom of the shock tube to the frame, I guess I need to figure out if my springs have as much down travel as the shock can provide, because if there is more to go I could likely get away with the 12" and not limit my down, and gain more up travel. To maximize on a longer shock it has to be mounted high enough to not limit the uptravel. Are you saying that at most you have 3-1/2" of compression in the shock? Not nearly enough. I will try to find a picture of mine flexed with my 12s. My front shocks have 5-1/4 inches of compression and I bottomed them when I had 12 inch Bilsteins that were the same length as the current Rancho RSX shocks. That's freaking genius. Time to get out the plasma cutter. I think that is by far the best option. I mean the shock sticks past the frame 3 1/2"
Worked for me and gave me about 3" more up travel. Here is a shot from my 2011 Moab trip when I still had the 12" Bilsteins. The flex shot on Kane Creek shows how much compression and extension I have in the front suspension. I think my front tire on the passenger side was just barely scraping the dirt. Still looks like a good bit of travel even on the 12" I am going to go with willards suggestions and relocate the shock mounts to the top of the hoops. Ideal i would like to use the 14" if possible. Im hopeful to have this all worked out this weekend. Ive been yearning to go on a offroad trip. Okay, so I did the same as you did. My worry now tho is that the shock angle is bad. It's a bit past vertical l, will that be an issue at full flex? What's your concern about the angle? Honestly it improved my on street driving characteristics. I have had zero issues during suspension travel. Yours looks about the same as mine is. Well I haven't rolled it up a ramp to test it yet. I guess I've just always seen shocks angled inward. How's it do off-road? It's seems okay at full stuff? I was thinking with that angle slightly outward, that when the axle lifts it would put pressure on the shock. Think of it almost trying to bend the shock from outside pushing inward. I could be totally wrong. Great off road as well. You will be fine. I pulled the studs out and filled in the holes with weld and tried again. On the second time I must have heated up the ring to much and warped it a bit, it wasn't even close now. Not to happy about it, and i'm tired of messing with it. I ended up biting the bullet and spending money on the Rock assault housing . 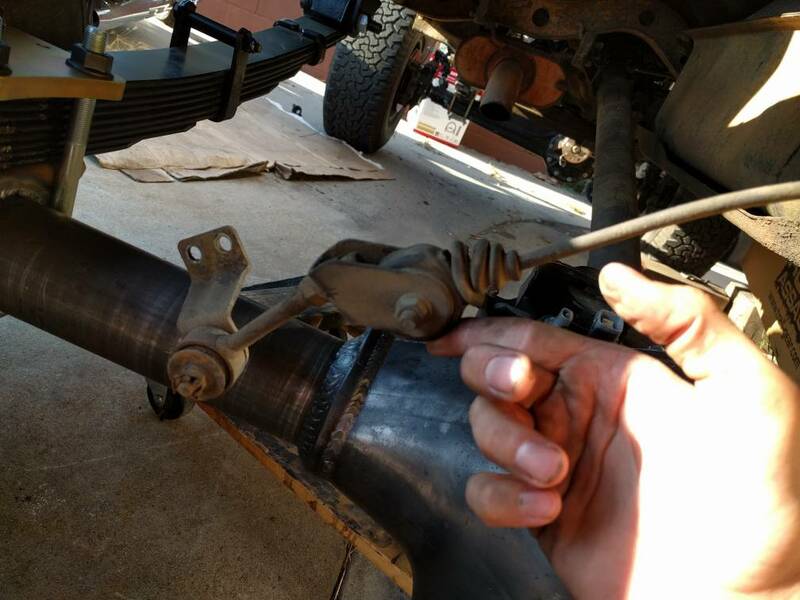 The studs were not perfect on it either and ended up using a soft hammer to bash on them and get the located close enough to finally bash the diff into place. Can't anything install like it should? Lol, however the housing looks very stout. Nearly half inch of metal that the studs bolt through. Now i'm cutting off all the old pieces to weld them on the new axle housing, (brake line tabs, e brake tabs, etc). Got the spring perches on it and gave an additional 2 degrees of pinion angle from stock and the 4" springs. What angle did you guys have to add to your axles to make it right? Im getting so close I can feel it! I just need to get the new shock mount for the rears in and ill have it all ready. Hopefully by next weekend! 1) After I put the gas tank back in I couldnt seem to figure out where this bolts too. Can anyone take a picture and add it here? 2)What is this bar thing for and do i need it? 3) I was thinking to swap the axle sides to have the ebrake stuff pushed forward. It seems like it would be safer from the rocks. Any opinions or insight on that? Will it effect the brakes or anything? Do I need this thing?? No you don't need it, but you can just bolt it up underneath the truck. It's your LSPV. Google it, there are many threads about removing/relocating it. Anyone show how the mounted it? I have mine hanging since I had to weld in the upper shock mount in it's location. Also I think mine is seized since i can push it in at all. Its not something that gets pushed in. How it works is more like a lever, the angle at which it sits adjusts the amount of braking going to the rear wheels. Example: when towing your rear sits lower, adjusting the brake proportions. Get rid of it and install an adjustable valve. Did you install an adjustable one? Are there certain trucks that have them? Im going down to the junkyard next week and would try to find one if that's the case. Yes I installed an adjustable willwood valve. Works great and I was able to get some tuning out of my brakes. There inexpensive. Look it up on amazon or ebay. it is not only for load sensing(weight over rear axle) but also balances brake pressure(disc vs drum) front to back, which is why it has a line going to the front brakes to ensure the rear brakes don't lock up before the front(or to make sure the rear brakes never get more pressure than the front but allow the rear brakes to "catch up" to the front since drums need to travel further to engage). removing it also removes that built in safety. if you do remove and install a proportioning valve, it would be wise to re-adjust it depending on conditions. for instance, if you are street driving on icy roads but adjusted it during the summer, it is possible if you had to stop fast that the rear brakes would lock up first and put you in a tail spin. it is not only for load sensing(weight over rear axle) but also balances brake pressure front to back, which is why it has a line going to the font brakes to ensure the rear brakes don't lock up before the front. removing it also removes that built in safety. if you do remove and install a proportioning valve, it would be wise to re-adjust it depending on conditions. for instance, if you are street driving on icy roads but adjusted it during the summer, it is possible if you had to stop fast that the rear brakes would lock up first and put you in a tail spin. I second this post, I re adjust mine based on terrain and such. So as stated if it's a dd just cut and zip tie. Well I have the valve on still but I just removed the bar that goes to the axle. I'm guessing that part is the load sensing? Cutting would essentially do the same thing. Plus the rubber boot was all ripped up so I figured it didn't matter. So it should still balance the pressure, But just not adjust since it's not connected to the axle. Now just need to figure out how I'm going to mount it..